In the world of hearing technology, Starkey has a long history in innovation, collaborating with their sister institution, the Starkey Hearing Research Center in Berkeley. Starkey was the first company to introduce the in-canal hearing aid and the first custom, fully programmable invisible hearing aid. In 2015, Starkey received the Silver Edison Award for the Halo Made for iPhone hearing aid and previous awards for SoundLens, AMP, and Xino Tinnitus products. The Starkey Hearing Foundation has donated more than 1 million hearing aids worldwide to different countries and has fitted hearing aids for free for people who are hard of hearing in developing countries such as Vietnam, Mozambique, Malawi, and Mexico. The Muse is Starkey’s newest line of hearing aids. Muse hearing aids are wireless and made for complex listening environments, giving wearers clarity and comfort in noise, high-quality music listening, improved speech recognition, and an ultra-high definition audio experience for every situation. Powered by the new Synergy processing platform, and the Acuity operating system, Muse hearing aids provide a high-definition audio experience for wearers. Muse hearing aids give wearers a rich audio experience by processing multiple sounds simultaneously. To address the challenges of speech recognition, Muse hearing aids are equipped with features such as Acuity Directionality and Speech Shift, to clarify and protect speech in challenging noise environments. By connecting wirelessly to smartphones through the SurfLink app, wearers are able to stream phone calls, music, and other media directly to their Muse hearing aids. For musicians and music lovers, Muse offers a high-definition, refined listening experience. For those who suffer from tinnitus, Muse is equipped with Starkey’s Multiflex Tinnitus Technology, a sound therapy program to provide relief from the frustrating symptoms of tinnitus. Muse hearing aids are available in a number of standard and customizable styles: completely-in-canal, in-the-canal, in-the-ear, receiver-in-canal, and behind-the-ear. Starkey’s Halo Made for iPhone was awarded the Silver Edison Award in 2015. The new Halo 2 improves upon its predecessor as one of the world’s smartest hearing aids. 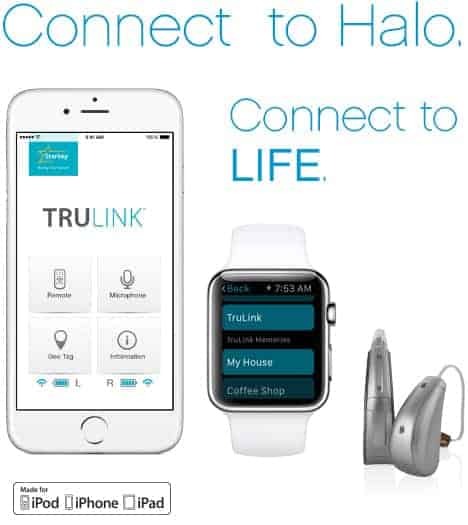 Through the downloadable TruLink Hearing Control app, Halo 2 wearers are able to directly stream phone calls, music, and other media directly from their iPhones to their hearing aids. Additionally, the TruLink app offers the option to activate the iPhone’s geo-tagging feature, which will archive wearer hearing preferences in different spaces and automatically readjusts to those preferences when wearers return, for a truly seamless and natural listening experience. Halo 2 is designed with feedback reduction, noise reduction, and directional microphones with give wearers the most comfortable listening experience. In terms of style, Halo 2 is fully customizable and available to be worn in receiver-in-canal (RIC) and behind-the-ear (BTE) styles. Starkey’s Z Series hearing aids are powered by a new operating system, BluWave 4.0. Z Series offers the following new and improved features: Binaural Spatial Mapping and Voice IQ2, Multiflex Tinnitus Technology, and HydraShield 2. Binaural Spatial Mapping simulates binaural hearing to give wearers a full spectrum of sounds in their environment. Voice IQ w supports the brain’s speech recognition process and allows wearers to focus on the sounds they want to hear in any environment, while preserving speech. As wireless hearing aid, Z Series connects to SurfLink2, allowing wearers to stream phone calls, music, and media directly to their hearing aids. 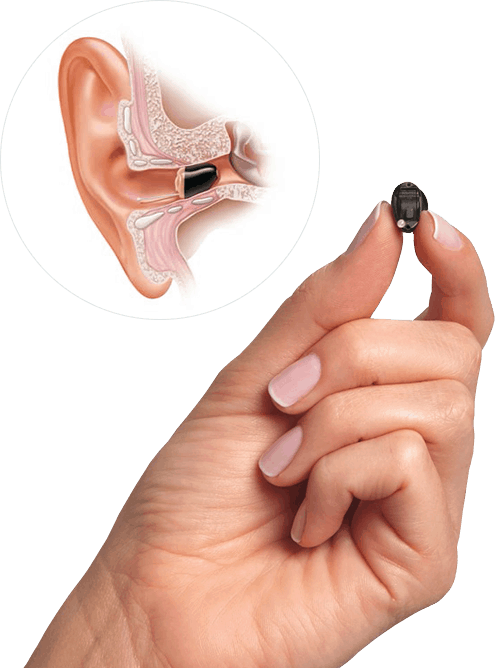 Z Series hearing aids are available in the following styles: invisible, receiver-in-canal, completely-in-canal, behind-the-ear, and in-the-ear. For people who experience single-sided deafness, Starkey offers CROS hearing aid models.